To nurture and support our practice of service, we offer community practices, including morning meditation, weekly women’s and men’s lodges, Wednesday night Heart Club, Thursday night zikr, and Friday night Shabbat service; and smaller group activities such as yoga, drumming, poetry-reading, contact improv, tribal healing, kirtan, Japanese tea ceremony or other offerings that those who are on the land might wish to share. In addition, retreat teachers often share teachings specifically for community members during their retreats. In this way, the summer community becomes an open forum of shared teachings, a reflection of the current community’s unique composition. 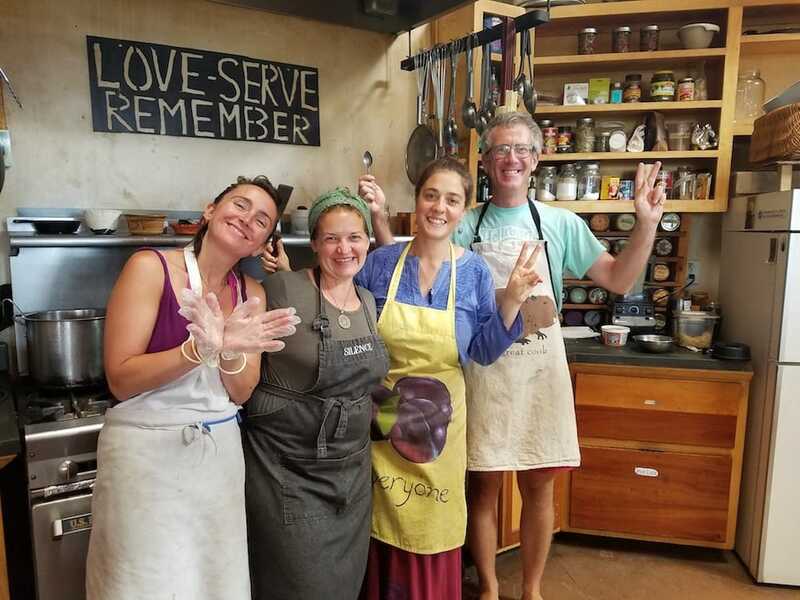 We live at Lama because we value the teachings that come with consciously living in community. The Lama “curriculum” offers opportunities to develop skills in community building; to deepen in self-awareness; to experience teachings from various spiritual traditions; and to apply those skills of awareness and experience to our work, our meetings, and our service. A group of summer stewards cooking a meal.